The first morning on Jeju island starts early. 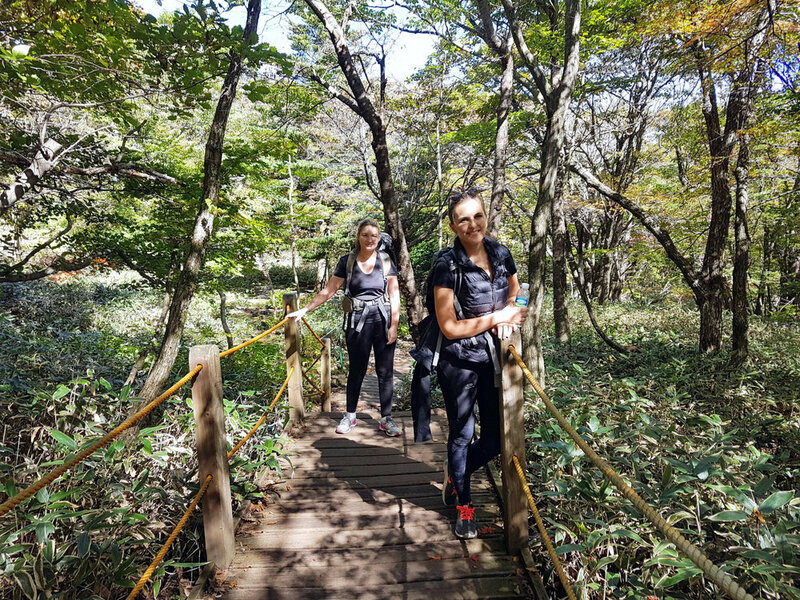 Ina, Isabel and myself have decided to climb the highest mountain of South Korea, Hallasan. The chilly morning breeze feels fresh on our faces and all of us are exited to start the adventure. And like every adventure, even this one taught me something. Here are eight things that I learned from climbing a mountain. The goal is clear. You have a plan and a good amount of determination. Together with your friends you are ready for adventure. The sky is open and there are no limits for what you can achieve together. The first part of the journey flows like a dance and nothing can stop you from taking conquering the world. Or the mountain, to start with. 2. Sometimes the road is rough. Be prepared for sticks and stones. There are unexpected turns and difficult terrain ahead. Some parts will be really, really sweaty. Some more than others. Sometimes the road is rough and moving forward goes much slower than you had imagined. But no matter how slow the progress, moving forward is what matters the most. Do it with people that have an open and positive mind. Take with you friends that will bring you up when you feel tired and who will take your support when they need it. Lean on me, I'll lean on you, you know. Do it with people, who know how to have fun but who also know what it means to set a goal and stick to it. It won't be easy all the way, but it sure will be beautiful. You will see and experience things you never imagined you would. There will be moments when you are out of breath, not only because you feel exhausted but because of something so beautiful comes along that it simply blows your mind. 5. There will be a point when you want to give up. At some point you will think you are about to reach a waypoint but the road just takes another turn and continues for lengths that at the moment feel like forever. You feel completely beaten. This is the part where you lean on each other, you push and drag (or whatever tactic works for you) one another other forward one step at a time and all of a sudden, bit by bit, the journey starts rolling again and your steps feels a little lighter. 6. It is okay to take a rest. Actually, sometimes it is essential to take a break. Sometimes you just need a good moment to gather yourself, your powers and motivation and re-think why the h*ll you are even doing all this. You are exhausting yourself doing something that at the moment feels like the most insane thing you ever given yourself into. Give Yourself a Break. Just do it. Afterwards you will be much better off for the rest of the journey. 7. You will get there. Often times it is about persistence. But you don't need to do it alone. A wise woman once said: "They say it's going to be lonely at the top, but if you bring others with you, it's not going to be lonely at the top". During the hard moment, keep in mind what you are going for and how long you've come already. Encourage your friends and let them inspire you. Together you will get there. Happy girls on top of the world! When you finally reach the top, you will feel accomplished, humble, relieved and most of all, grateful. You stand on the top of the world.The wide blue ocean and endless sky open up in front of you. Yet you realize, that at least as much as the top, it is the journey, that made it all worth it. When you look at the view and the beautiful, Beautiful world we have the privilege to live in, you'll probably feel the urge. To climb another mountain, to sail another sea. And next time, you will be a little more prepared - a little more ready for the journey.